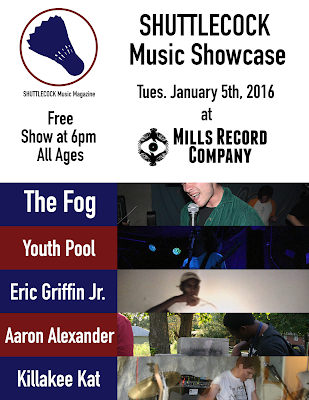 Today I am very excited to announce to you SHUTTLECOCK Music Magazine's first showcase. Five young local acts that we think are some of the best in the city will be performing a show together. The show will be happening on my 19th birthday, January 5th, 2016 at Mills Record Company. Things will kick off at 6pm and the show is free of charge. All of the artists performing (besides The Fog - for now) are ones that have been covered here on SHUTTLECOCK and not too many other places. So here's the lineup! Get updates on the show and invite your friends on the Facebook event page for it and don't forget to like us on Facebook and follow us on Twitter. We can't wait to hang out with you all!